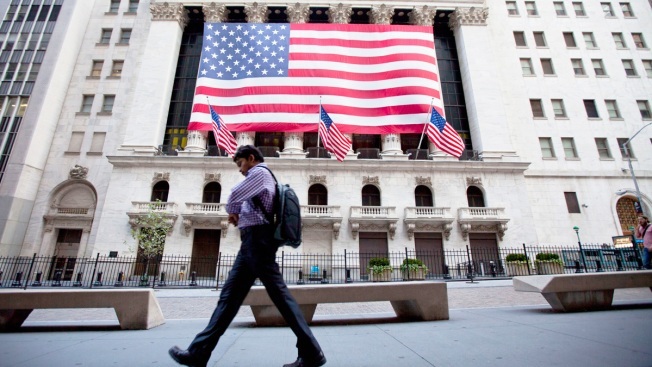 In this Aug. 5, 2011, file photo, a pedestrian walks past the New York Stock Exchange. A global forum of banking regulators has finished its years-long work on rules that aim to keep weak banks from needing taxpayer bailouts and setting off financial crises like the one that led to the Great Recession. The oversight board of the Basel Committee on Banking Supervision agreed on the last batch of rules at a meeting Thursday in Frankfurt, Germany. A key part of the debate on the rules is how far banks should be allowed to diverge from regulators' assessments of how risky their holdings are. European Central Bank head Mario Draghi, who heads the Basel Committee's oversight board, said Thursday that the step was "a major milestone that will make the capital framework more robust." The package "completes the global reform of the regulatory framework, which began following the onset of the financial crisis," he said. The Basel committee rules have been an ongoing international response to the 2007-2009 financial crisis that saw the bankruptcy of U.S. investment bank Lehman Brothers and taxpayer bailouts of big banks. The financial crisis was the prelude to the Great Recession that saw many people lose their jobs and homes. Governments in the United States, Europe and elsewhere were pushed to rescue banks to prevent a cutoff of credit to businesses that would further harm the economy and increase unemployment. The new rules, dubbed Basel III, toughen an earlier set of rules and take effect from 2022. The idea is create a level playing field for banks globally and prevent troubles from spreading through the financial system. The first set of Basel III rules were published in 2010 and implemented gradually. The rules increased the amount of capital banks had to hold as a financial buffer, as measured against the risks they had taken by extending loans like mortgages. Such capital ratios, as they are called, have been criticized as not enough to ensure a stable financial system because bankers can find ways to get around the complex system of determining how risky their activities are. The new rules limit banks' ability to arrive at a lower assessment of their level of risk than that calculated by regulators. The new rule says that the banks' estimate of the total pile of assets against which capital must be held must not be less than 72.5 of regulators' estimates. Draghi said the limit would prevent banks from lowballing risk in their calculations, which in the past had led to "imprudently low" capital buffers. Higher capital levels mean a more stable bank. But that prevents the use of those financial resources for potentially profitable activities like loans or investments. The problem was that before the financial crisis, the banks tended to take risks and keep the profits when risks paid off — and required bailouts from taxpayers when the bets led to losses. The new rules are "definitely an improvement," said Volker Wieland, professor at the Institute for Monetary and Financial Stability at Frankfurt's Goethe University. He said the rules "reduce the risk and severity of financial crisis coming from banks." Wieland, a former economist at the U.S. Federal Reserve, said the new system of rules "prevents the banks from calculating down the risks too much." The regulators could not agree, however, on requiring banks to hold capital buffers against possible losses on government bonds, even though the default by Greece during the eurozone debt crisis shows that sovereign bonds are not free from risk. Basel committee chairman Stefan Ingves, who is also governor of the Swedish central bank, said that "there was no consensus on how to deal with sovereign risk." The Basel Committee, based in the Swiss city of that name, includes central bankers and regulators from 26 countries plus Hong Kong and the European Union. Standards agreed by the committee must then be enacted at the local level by member countries over a period of years.